These activities go along with the movie War Horse, not the book of the same name. Guided viewing worksheet for during the movie War Horse. Follow-up activity after watching the movie War Horse: Compare/Contrast. Is War Horse a Good US History Movie? 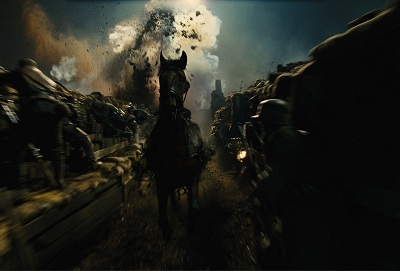 The movie War Horse is an excellent complement to any World War I lesson plan. War Horse in the trenches during WWI. US History Teachers should plan for three class periods to complete the movie War horse, along with a fourth day for activities and class discussion. 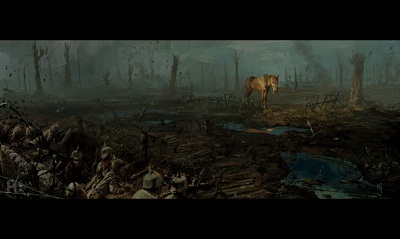 War Horse brilliantly depicts the time period of World War I before, during and after the war. The battles are extremely realistic and show many examples of WWI era technology, weaponry, strategy and tactics. War Horse has the most realistic WWI era Trench Warfare scenes ever put on film. Life in the trenches, no-man’s land, the use of heavy artillery and emerging tank warfare are all shown in the movie. There are many scenes of violence including large scale battles, injured horses being shot, the execution of deserters and soldiers experiencing a poison gas attack. However, all of this is handled well and within the context of the time period. 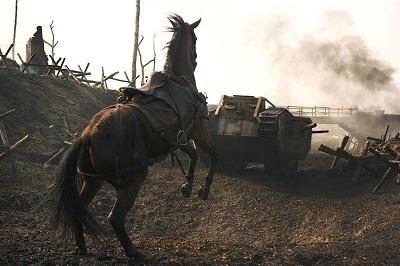 War Horse and a WWI era Tank. Click Here for a Special offer on War Horse (Four Disc Combo: Blu-ray/DVD + Digital Copy) LIMITED TIME OFFER! Have you used the movie War Horse in your US History Classroom? Was this US History Lesson Plan useful? Share it with your colleagues below! It looks like this resource has been moved! What type of lesson plans are you looking for? Use the search bar or links below to find the lesson plans you need!